Lock in a great price for InterContinental Dubai Festival City – rated 8.8 by recent guests! Rooms were clean and staff very friendly as always. Near the airport port. Good location and nice view of the downtown. Every thing was perfect thanks a lot it`s my favorite place. InterContinental Dubai Festival City This rating is a reflection of how the property compares to the industry standard when it comes to price, facilities and services available. It's based on a self-evaluation by the property. Use this rating to help choose your stay! One of our top picks in Dubai.Adjacent to Festival City Mall, InterContinental Dubai Festival City features a 100 feet outdoor pool that extends onto a balcony with panoramic views of Dubai Creek. A full-service spa with aromatherapy is offered. Guests can enjoy a variety of dining option including The Fish House which serves the freshest catch - boat-to-table experience, or Pierre's Bistro and Bar - open in the evening only from 6:30 headed by renowned Michelin star Chef Pierre Gagnaire for a sensorial nightlife experience. After an energizing workout at the gym, guests can enjoy a relaxing massage at the spa. An array of aromatic therapies are available for guests to choose from. InterContinental Dubai Festival City has a direct access to Dubai Festival City Mall, with over 500 retail stores including the unique Robinsons, and home to the record breaking IMAGINE water, laser, light & fire spectacle. Dubai International Airport are a 10-minute drive away from InterContinental Dubai Festival City. 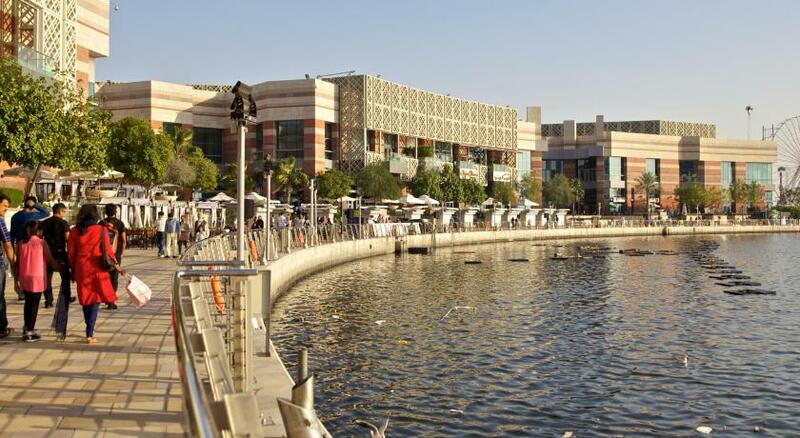 Dubai Festival City is a great choice for travelers interested in food, relaxation and luxury brand shopping. In this area you can shop 'til you drop for popular brands like Gucci, H&M. When would you like to stay at InterContinental Dubai Festival City? Located on levels 5 to 9, guests will enjoy sweeping views of the historic Dubai creek with dhow builders and abras. Watch the sun set over the city skyline and Burj Khalifa. Elegantly furnished with plush king bed and opulent marble bathroom rain shower separate bath. At 88 sqm this suite is perfect for those needing some extra room to relax. Light pours in through large windows to an elegantly appointed living room and plush master king bedroom. Opulent marble bathroom with rain shower and standalone bath. Contemporary decor of pale creams and dark timbers create a warm and calm ambiance in this spacious light filled 42 sqm king bed room. Opulent bathroom with rain shower standalone bath and dark marble add comfort and luxury. Located on levels 19 to 25, the contemporary designed Suite offers elegant decor and stunning views of the historic dubai creek and skyline. 96 sqm. For the discerning traveler the quiet luxury of Club InterContinental provides the very best with exclusive lounge a la carte breakfast afternoon tea evening canapes & drinks. Located on levels 9 to 18, the room is elegantly furnished with plush king bed and opulent marble bathroom rain shower separate bath. Guests will enjoy panoramic views of the historic Dubai creek with sunsets over the city skyline and Burj Khalifa at the Club Intercontinental along with a la carte breakfast, afternoon tea and evening canapes. Located on levels 23 to 25, this suite features contemporary designs and views of the historic dubai creek and skyline. It includes a king and twin bedroom, each with it's private bathroom. A spacious living room and dining room are also included. It includes club lounge access. Levels 23 to 33.Contemporary life meets traditional origins with bustling dubai and meandering water views down to deira. This 135 sqm suite is perfect for families. Elegant king and twin bedrooms each with own luxury ensuite. Pantry and guest powder room spacious living and dining room. This suite has a seating area, bathrobe and CD player. Hotel surroundings – This neighborhood is a great choice for travelers interested in food, relaxation and luxury brand shopping – Check location Excellent location – show map Guests loved walking around the neighborhood! House Rules InterContinental Dubai Festival City takes special requests – add in the next step! Any additional older children or adults are charged AED 180 per night for extra beds. InterContinental Dubai Festival City accepts these cards and reserves the right to temporarily hold an amount prior to arrival. The hotel offers transfers from Dubai International Airport to the hotel. Guests are kindly requested to inform the property in advance if they wish to make use of this service. Contact details can be found on the booking confirmation. Please inform InterContinental Dubai Festival City of your expected arrival time in advance. You can use the Special Requests box when booking, or contact the property directly using the contact details in your confirmation. One of the best hotels in Dubai for location, comfort, room size, value for money, amenities and one of the best breakfasts I have ever eaten! They charged me 500 Dirham as a deposit and I've not received it YET!!! and I wonder WHY. The check in was so slow even in the lounge! The service and walcoming is bad no welcomeing atmosphere at all keep in mind that we have one of the biggest suite in hotel Lobby very crowded There is no shataf in toilet only in gust toilet!! We are in Dubai ! The check in experiance was bad and slow, One of the stuff in reservation called me to collect the money and gave me wrong information, ex. He told me I reserve one room only but the fact I reserve room and suite. A trainer receptionist who took long time for checking in and deducting more money as she said she has to block more money on my master card 1300 dhs when I check out they told me that the money will come back later on. Also she gave me very bad room and very narrow in the fifth floor. I came down and complain to her she said this your reservation in booking when the senior receptionist saw me very nervous he calm me down and gave me very nice room in higher floor 15th floor. Inspite that she told me first if you need higher floor you have to wait more than 2 hours ?! This cause me delay attendece in my conference . The senior receptionist ( Pakistan) was very polite and save the situation.